Washington, D.C. (August 5, 2015) ­– U.S. 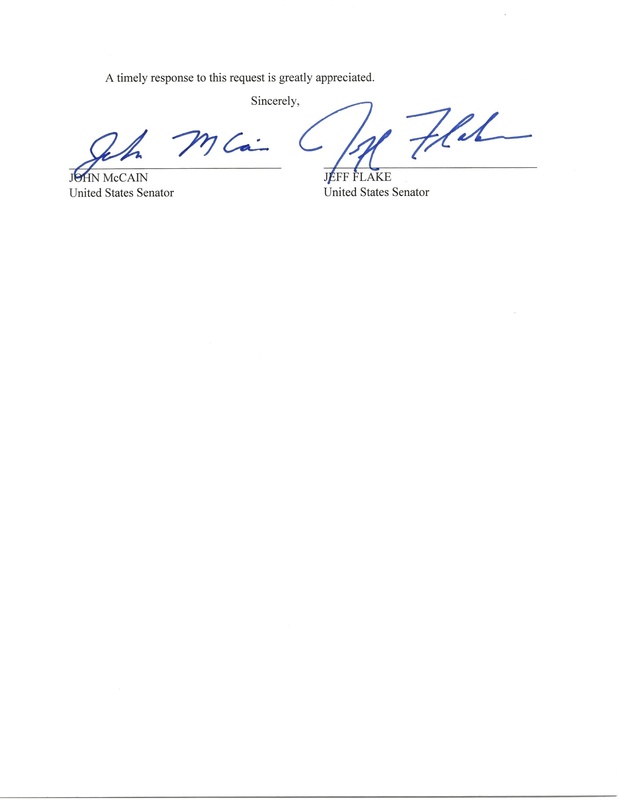 Senators John McCain (R-AZ) and Jeff Flake (R-AZ) today sent the following letter to the U.S. Forest Service and the Arizona Department of Agriculture requesting that they postpone the roundup of horses from the Mesa Ranger District on the Tonto National Forest until there has been sufficient public engagement in the process, and that they respond to questions. We are writing to inquire about your plans for removing up to 100 horses from the Mesa Ranger District on the Tonto National Forest. 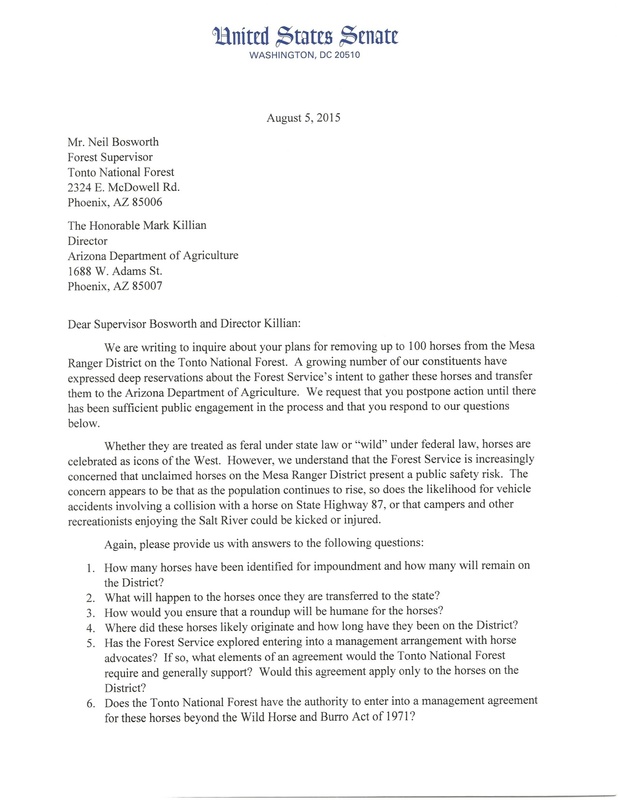 A growing number of our constituents have expressed deep reservations about the Forest Service’s intent to gather these horses and transfer them to the Arizona Department of Agriculture. We request that you postpone action until there has been sufficient public engagement in the process and that you respond to our questions below. Whether they are treated as feral under state law or “wild” under federal law, horses are celebrated as icons of the West. However, we understand that the Forest Service is increasingly concerned that unclaimed horses on the Mesa Ranger District present a public safety risk. The concern appears to be that as the population continues to rise, so does the likelihood for vehicle accidents involving a collision with a horse on State Highway 87, or that campers and other recreationists enjoying the Salt River could be kicked or injured. How many horses have been identified for impoundment and how many will remain on the District? What will happen to the horses once they are transferred to the state? How would you ensure that a roundup will be humane for the horses? Where did these horses likely originate and how long have they been on the District? Has the Forest Service explored entering into a management arrangement with horse advocates? If so, what elements of an agreement would the Tonto National Forest require and generally support? Would this agreement apply only to the horses on the District? Does the Tonto National Forest have the authority to enter into a management agreement for these horses beyond the Wild Horse and Burro Act of 1971? A timely response to this request is greatly appreciated. 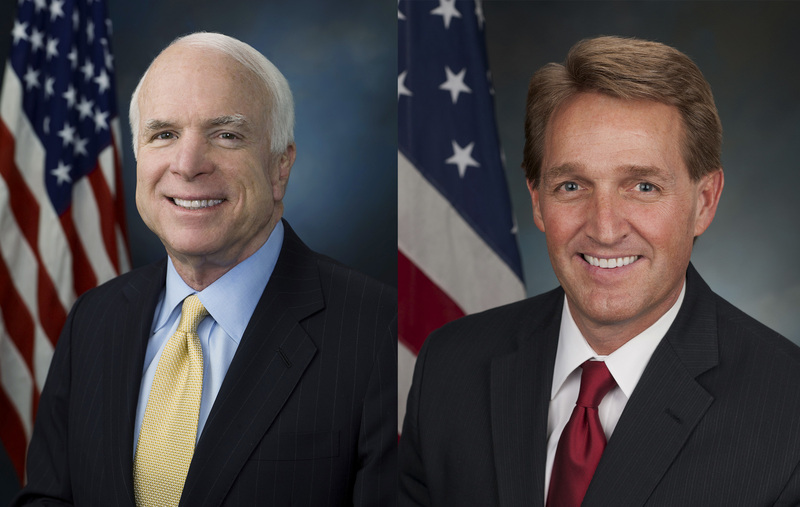 Protect Mustangs wants to especially thank Senator McCain and Senator Flake as well as Victoria McCullough for coming to the rescue of the Salt River Wild Horses. 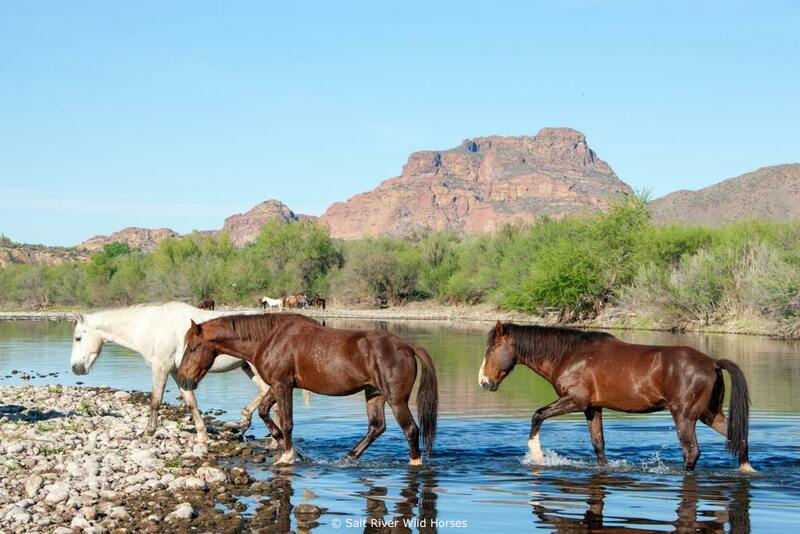 The Forest Service has issued a Public Notice (publicnotices.azcapitoltimes.com/search/detail.aspx?detail=10583672) stating the Salt River Wild Horses will be permanently removed beginning August 7, 2015. These horses were virtually unknown until 2012 when photographer, Becky Standridge, documented a wild stallion named Champ (www.youtube.com/watch?v=-SXbVw4qojg) rescuing a filly from drowning. Since then, this act of compassionate heroism has been viewed over 1.5 million times on YouTube and the Salt River Wild Horses have become one the most famous group of wild horses on the planet – with fans residing at least 45 different countries. The Forest Service classifies the horses as feral and unauthorized (which legally permits them to be removed) because they were not included in the Census that followed the passing of the 1971 Wild and Free-Roaming Horses and Burros Act. The Mesa Ranger District had three years to complete the Census. This period began with management that had decided to create a wild horse territory and ended with new management that redacted the decision and stripped the horses of their legal rights. Never the less, photographic evidence places the horses on the Tonto National Forest in the 1950s and printed documentation archives their presence back to the 1800s. It has been said, “the horses have been there forever.” Forever may mean they are the descendants of the noble steeds that once belonged to the Spanish Jesuit Priest Father Eusebio Kino or of the U.S. Cavalry mounts that General George Crook and Fort McDowell soldiers used during their campaign to capture Geronimo. Either way, generation after generation after generation has been born, lived and died wild – they have a right to remain this way. 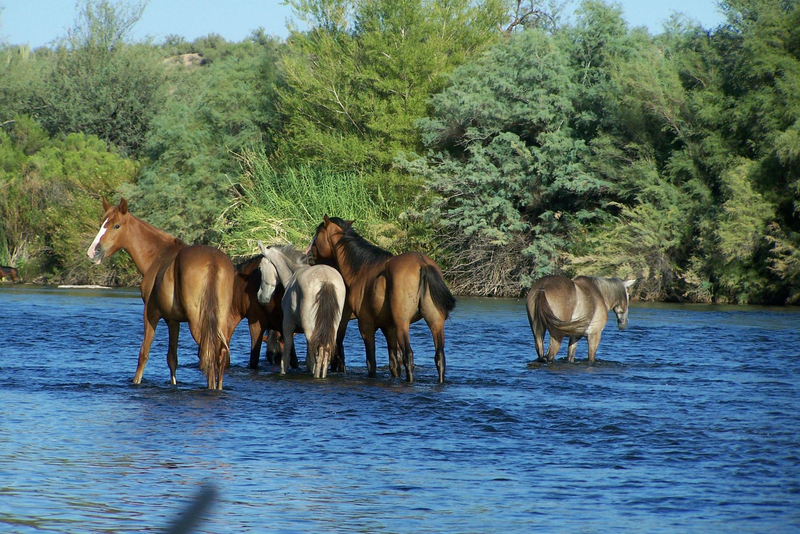 Recently, a rumor has been circulating that some of the Salt River Wild Horses have not been able to access water. This rumor is being used as one of the justifications for removing the horses, however, the premise is not true so the conclusion is invalid. These horses know where to find water; at the furthest extent of their home range they are only a few miles away from water, they have many routes to reach any location and they can travel distances in a short period of time. These horses have existed for a very long time without the intervention of man. Rumor has it that concern over the horses becoming injured or dying is justification for their removal. This is absurd. Domestic horses are also at risk or being injured or dying. So are we. It is a fact, that in living we are all at risk but we don’t lock ourselves away or give up. It is wrong to eliminate the wild horses under the false pretense of helping them. The Forest Service’s Public Notice states the horses may be “condemned and destroyed, or otherwise disposed of.” The removal effort alone will place the horses under undue risk of injury that may result in death. All the horses will suffer tremendous fear and all will loose their freedom. Despite the fact that horses do not have the facial muscles to express themselves as we do, they still experience emotions, suffer pain and cling to life just dearly as we do. We need all interested individuals, regardless where you live in the world, to call, email and/or mail the three individuals listed below. Also please contact as many Congressmen (www.contactingthecongress.org), Senators (www.contactingthecongress.org), Forest Service personnel (www.fs.fed.us/about-agency/contact-us), Arizona Department of Agriculture personnel (azdirect.azdoa.gov/AgencyView.aspx?Agency_ID=239), Arizona Game and Fish personnel (www.gf.state.az.us/inside_azgfd/agency_directory.shtml), BLM personnel (www.blm.gov/wo/st/en/info/directory.html) and the Media regarding your desire to preserve the Salt River Wild Horses. If you can think of anyone else that should be contacted then please do. We need to contact everyone possible as quickly as possible. We need to contact so many people that even the people we contact in other agencies and states will begin calling the three individuals above to encourage them to resolve the issue. We do not have all the contact information readily available for everyone so if anyone obtains helpful references then please add them to this post for others to reference. Please refrain from sharing emotional comments on this post so that the contact comments will not become lost in the comments. Now is the time to act on behalf of the Salt River Wild Horses. Time is of the essence. Champ’s life is at stake and so are the lives of all the Salt River Wild Horses. We can do this if you help. Please be polite when expressing your comments and contacting people. Please express yourself using your own thoughts and words. Feel free to reference information in this post but please be sure to use your own words. Please share this post with as many people as you can and know how very much we, and the Salt River Wild Horses, appreciate your support. allowed in three sites along the river on its south side. The Phon-D.
Sutton Recreation and wildlife viewing area is found on the lower side. certainly worthy of our input and collaboration. areas that are not overly polluted or otherwise degraded. whole life community, including humans. another band of six was encountered, including a pregnant gray mare. roan stallion was keenly aware of his intentions. particular portion of the river habitat became over-browsed or grazed. splashing sounds that carried a long ways. Sunfish were also present. were also present. Sign of Muskrats were detected on the river banks. sign of a former beaver, submerged when the river was at a higher level. common here and whose leaves and twigs I observed the horses eating. water Eelgrass seemed to log the most time in the horses schedule. and for concealment. Puma occur here, as well as coyotes and bobcats. here: the Mule Deer and the Whitetail Deer. dis-equilibrating effect upon the Salt River ecosystem. “principal” resource recipients within their legal territories (USFS). stream banks and other riparian areas, or upon the river itself. mosquitoes, which brings me to my next topic. eutrophication could set in to the detriment especially of animal life. and trees that have adapted to the hot and arid conditions here. stagnant areas and prevent toxic anaerobic conditions from developing. geese, quail and doves, seeking their nocturnal abodes as well. positively. One such opportunity is Salt River. brush back with chain saws. But Koniks are cheaper and better at it. their ancient niche within their ancestral lands in North America. and what’s more it is especially beautiful! Dung beetles, reducing horse droppings and enhancing food chain, e.g. overhead, crying out with hoarse cry. Cave Myotis, Little Brown Myotis. waters, sewage, along edges of river. habitat for birds and other animals. Food of wild horse: Eelgrass, Willow, Cane Grass, Tamarisk (a.k.a..
chase of white stallion by pink roan. as seen on 9/25), 1 w/ 3 wh’s. GPS: 33 d 32.720’ N; 111 d 40.264’W. swish tails, throw water, twitch skin to repel flies. d 31.279’ N; 111 d 39.179’ W. 1,349’ elev. 2:53 PM. 9/27/12: Same band of 6 observed in earlier days, observed followed. ran to cover under tiny bush. N; 111 d 40.305’W. 1,331’ elev. lizard trapped in open barrel, dead. cormorants. Least Bittern and Upper Clapper Rail also are common here. annual Christmas Bird Counts occur here each year. through here in fall and spring. Cowbirds are numerous and parasite nests of other birds. Reef Dam and the SR 101 freeway. nesting birds. ATV’s impact flood-plain vegetation and cause erosion. Blue Heron, Great Egret, Southwestern Willow Flycatcher, Abert’s Towhee. Verde, and Ironwood are the dominant upland trees. Abbey, Edward, et. al. Cactus Country. The American Wilderness. McCarry Charles. The Great Southwest. National Geographic, D.C.
Niering, William A. The Life of the Marsh. Our Living World Of Nature.